In 2014 Mac Schneider won the Midnight Half in 1:16:00. Mac practiced the route ahead of time, he had the most efficient path, he took risks, he jumped fences and ran through projects..and he was fast as hell. He was the first competitor to take the open-course check-point format and use it to his advantage..and in doing so beat out guys like Matt Dinusson (2nd place 1:18:11), Asher Fusco (3rd 1:18:12) and the fastest guy to ever lose the Midnight Half, Jerry Faulkner (16th 1:26:27). After 2014 people changed their approach to this race, people realized that walking on this course without a strategy, without a plan, is a guaranteed way to not win. Cover image by Parker Feierbach. 2014 was a big year for the Midnight Half. Although the race had seen some fast local runners in its first 2 years, it wasn’t until 2014 that the level of competition had reached the next plateau in runner talent and ability. Mac Schneider was one of the guys that took it there. Mac executed a properly laid out plan of attack. His chosen course was the most efficient, his fitness level was high enough to keep other runners just out of reach..although Asher Fusco gave him a run for his money. 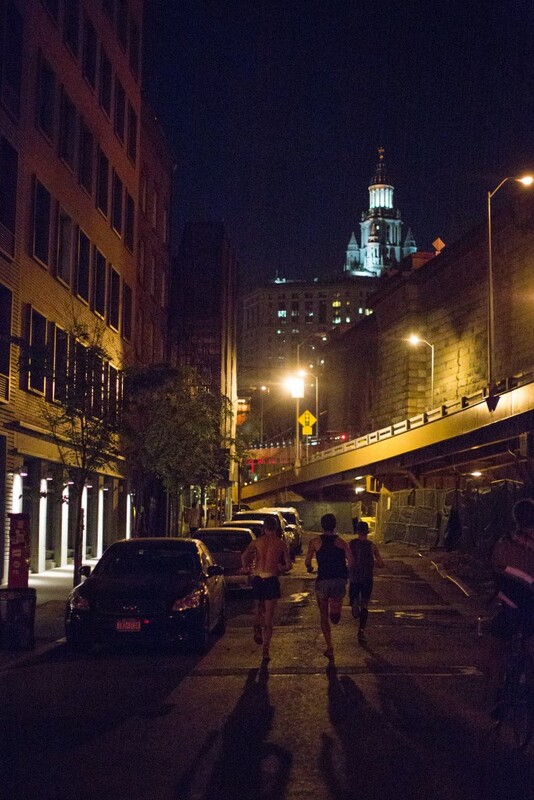 2014 Midnight Half, Mac in orange tank at the Dumbo Archway under the Manhattan Bridge. Image by Parker Feierbach. This year, that all changed. Mac saw a more prepared Jerry Faulkner and was introduced to trail running monster, Pat Casterline. Although Mac’s fitness level wasn’t exactly where he wanted it he came into 2015 and put up another stellar performance, finishing the course in 1:15:15. After winning the race in 2014 Mac disappeared. It wasn’t until shooting the image for the 2015 poster that we reconnected and had a chance to catch up with him and see what he had been up to. He had a pretty busy year, and saw some impressive finishes at some very big races. He came in 69th at the TCS New York City Marathon with a time of 2:36:38 (out of over 50,000 runners). Mac also finished 43rd at the Blue Cross Broad Street Run in Philly with a time of 54:39 (a field of over 35,000 runners). 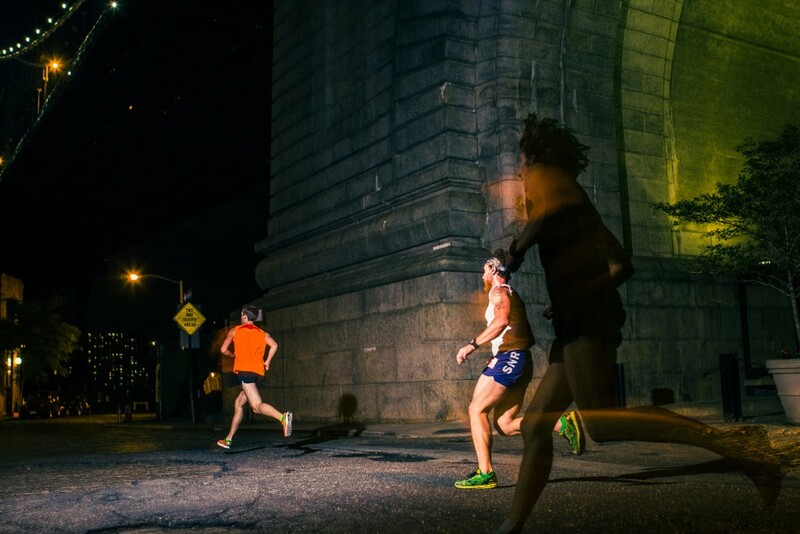 Jerry Faulkner (left), Mac Schneider (center) Pat Casterline (right) approaching the Brooklyn Bridge for the first bridge crossing at the 2015 Midnight Half. Image by David Trimble. Heading into this years race I was very excited to see how Mac would do defending his title, how Jerry Faulkner would respond to having lost the previous year, and if there would be another surprise victory by an underdog. By now anyone reading this should know how things played out. Pat Casterline fought his way to the top of the theoretical podium with a winning time of 1:11:57, Jerry had a strong showing but came up a bit short for second place with a time of 1:12:46 and last years champ settled into third with a time of 1:15:15. Thats how this race goes. So many variables it really is anyones competition. The following interview is one I have wanted to read for over a year, thanks again Mac. 1. How did you first find out about the midnight half? I found out about the race on Instagram and then googling it online. All I knew before I ran the race was that there wasn’t going to be a course so I wanted to make sure I took advantage of that opportunity. I’m talking sneaky tactics. 2. Why did you sign up in 2014? Did you think you were capable of winning? I signed up because I was getting the chance to run through NYC streets at midnight in a race against other people. I had never heard of anything like it. It also sounded like the race could only happen in a place like NYC and being new to the city I was eager to find ways to experience it. 3. What’s your favorite context to run in? Trail, street, track? Trails. I am from Seattle and nothing beats running in the mountains. Go Hawks. Bring back The Sonics. 4. What’s your training like right now? Up and down. I took a lot of time off during the winter due to job obligations, but I’m hoping to put in a strong summer of training to gear up for race season in the fall. 5. What shoes did you wear to the race this year? Why? I always wear Saucony Kinvaras to race and I chose a reflective pair because I like to have a little midnight flash. 6. How did you prep your route? I live and train in Brooklyn so I know the streets fairly well. I spent the afternoon on race day mapping out my course and committing it to memory. 7. What was your plan of attack going in, did you stick to it once the race started or did it get thrown out the window once the start happened? I threw my plan out the window at the start. I hadn’t even considered starting by crossing the Brooklyn Bridge, but when I saw Pat and Jerry lining up in that direction I switched gears and followed their lead. Nonetheless, I almost missed Pat slipping off the back of our pack to take the pedestrian entrance to the Bridge. I quickly doubled back and that saved me some time. From then on I stuck to the course that I had in my mind, partly because I thought it was the quickest but also because Pat was so far ahead of me I wouldn’t have been able to follow him if I had wanted to. It seemed to me that he definitely had a game plan going into the race and probably ran the least amount of miles. I wish I could have stayed with him to see exactly where it was he was shaving those extra steps. 8. What was it like having a target on your back, being the reigning champ? Being the champ rules. I got to wear the one penny and try to defend my title. It was a wild experience to have won it the first time and I was just feeling lucky to be back a year later. If I had a target on my back, I didn’t notice. From the get-go I felt like Pat and Jerry were the guys to beat and it was their backs that I was trying to put my target on. 9. What did it feel like to turn the corner on Ludlow, seeing the finish up ahead? What was going through your head? Did you know Pat Casterline and Jerry Faulkner had already gotten there? It felt lovely. This race really took a lot out of me. Crossing the bridges five times was no joke and I had no idea where anyone was the whole time. If I had to guess, I would have said third but if someone told me I was coming in 7th I wouldn’t have been surprised. That is part of the reason why I love this race: you have no idea what your place is or where the other runners are until the last possible moment. Because of that, I felt like I was constantly running harder than I otherwise would have been, just in case I was missing an opportunity to gain ground on someone else, wherever they might be. In those moments the temptation is either to dial it back and save energy for later or dial it up and gain ground when you can. I always ended up choosing the latter and after a whole race of that I was mentally and physically spent. It felt nice to cross the finish line and I was immediately iced. Smirnoff so tasty. 10. When you won in 2014, how did it feel to wake up the next day as the champ of this underground midnight race no ones ever heard of? As the organizer of this race it’s hard to gauge the value it has to others, what did being the champ mean to you last year? How does it compare to other races you have placed at, such as your 69th place finish at the NYC Marathon and your 42nd place finish at Broad Street in Philly? This is the first race I ever won and that was a great feeling in and of itself. Not only that, but to win this race in particular meant a lot to me. This is a race by runners for runners. Anyone who knows about this race is someone who has made a significant commitment to being part of a running community that I strongly identify with. That community isn’t about the flash of big time events or the glitz of medals and gear. It’s about putting in a hard effort regardless of the circumstances. NYC is a hard place to train as a runner because there are so many other distractions and you really have to rely on yourself to raise the caliber of your effort and commitment. On the other hand, those of us that live and run in NYC know how exhilarating it can be to run in a place where there are so many sources for inspiration. I think this race is a celebration of both the challenges and rewards of running here and to win it meant a lot. 11. Will you be back to vie for the title next year? If so, where do you hope to be in terms of your fitness level compared to this year? What will you do differently to prepare – having the experience of two Midnight Halves under your belt? No doubt I’ll be back. I hope to be at the same or better fitness level. I might want to put a few more races in during late winter/early spring to give myself a better shot of finishing as well as I have both these years. To prepare differently I will study the course even better than I have already. I really think half the battle is having a super solid course in your mind that you know saves you every possible ounce of energy. 12. In the context of the other races you run, where does the midnight half fall in terms of difficulty, gratification and importance? In terms of difficulty this year’s race was way up there. The only other harder experiences I have had were marathons, but that’s a whole different beast. There isn’t a more fun finish line to cross than the Midnight Half, knowing that your friends have walked over halfway through their Saturday night to come join the party. 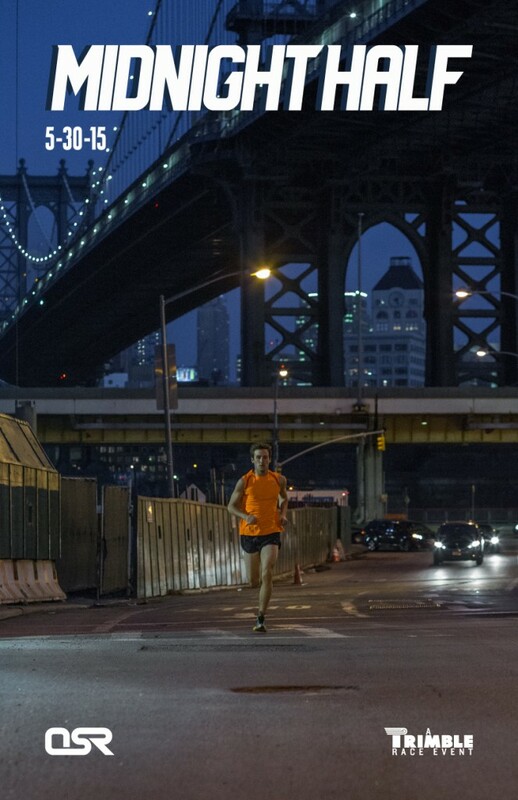 Mac Schneider the 2014 Midnight Half Champion featured on the 2015 Midnight Half poster, image by David Trimble, layout design by Jonah Birns.